I have had several clients in the last couple of weeks who have booked in with severe low back pain, unable to move without a great deal of distress. In the run up to Christmas, with all the work to be done in time for the holiday, many people are under a great deal of pressure to work long hours to finish in time. 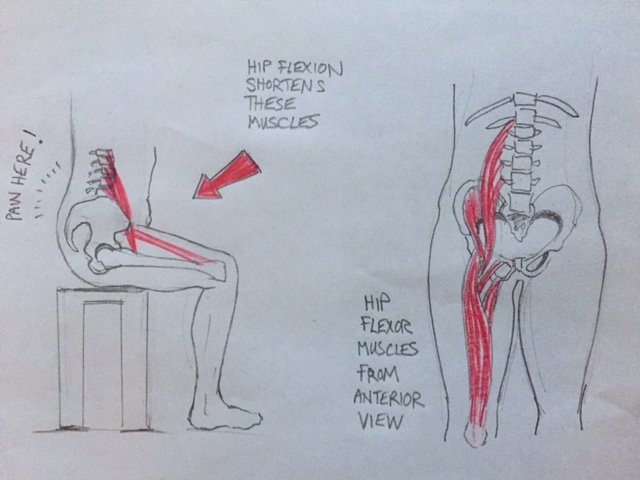 Whilst sitting for long periods of time at your desk, your resulting posture (flexing of the hip joint) allows the muscles at the front of your pelvis to tighten and shorten if they are not stretched out at regular intervals. You can see from the picture that if these muscles lock down tight, once you try and stand up, they will prevent you from being able to straighten your torso properly. Imagine if you try and put up a tent with one of the guy ropes much shorter than the others? It will pull the tent poles completely over to one side. This is a similar concept, with your hip flexor muscles being the shortened guy rope. The new resulting position in turn then upsets the muscles around your glutes and low back, which register the fact you are not properly upright, so fire away trying to pull your torso to a more upright position, resulting in low back pain and spasms, which can continue on and off until the muscles locked down tight at the front are released. Some deep tissue massage can easily help to rectify this situation, along with stretches to help pull out the tightened muscles at the front of the pelvis. To prevent this from happening in the first place, it is well worth stopping and stretching for literally just one minute here and there. It will save you days of having to endure low back pain.